The 'Lazy Willow' is a 'hand peeled' log home, barn and garage built in 1980. This authentic log home construction dates back to the founding of this country. It is seldom seen today due to the prohibitively high labor costs. If you are looking for the real Jackson Hole experience, this is the place! We are located on a former a cow/calf ranch which is now a cluster of homes on 3.5 to 6.5 acres for each ranch. All utilities are underground. Many of the properties have horses. 6 bikes are available for guests. 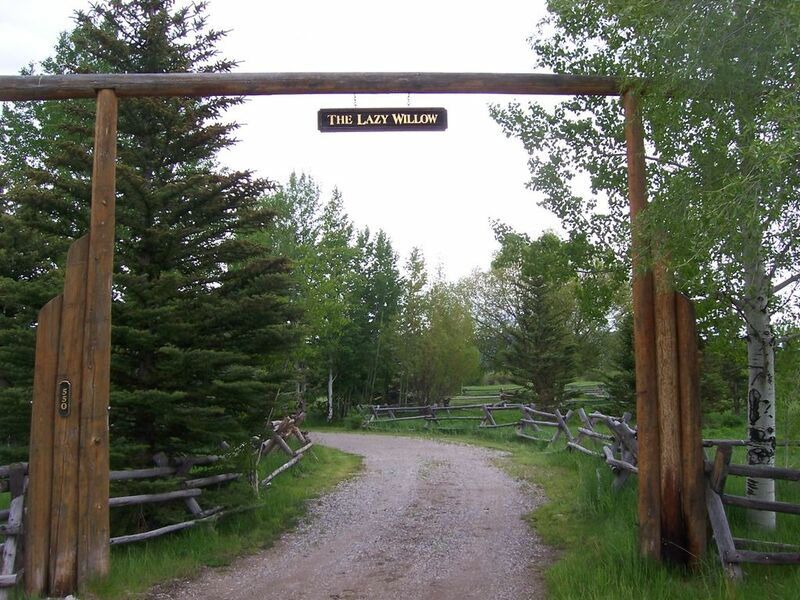 My wife and I stayed at the Lazy Willow for four days over the long Labor Day weekend and were completely enchanted by the cabin, its proximity to everything we wanted to do, and by the hospitality of its owners. The home itself is an incredible rustic log cabin with so many fantastic touches, decorations and amenities that we instantly fell in love with it. We can't possibly summarize all the details here but suffice it to say you will have every amenity you have at home and more including comfortable beds and a great flat screen tv in the living room (although we never found time to really use it). We did, however, find time to use the bikes and helmets Chuck provided for free (we took a nice ride from Moose to Jenny lake which we greatly recommend), a game of ladder golf on the lawn and, not to mention, the ping pong table in the garage which were pleasant surprises! The home itself is on beautiful pastureland with views of the Tetons all around. There are a couple of other cabins nearby but the property is designed in a way that you feel mostly isolated. My wife and I also LOVED sitting on the outdoor deck for breakfast and also having some wine at night gazing at stars under the most unbelievable star filled night sky. The cabin is close enough to everything (10 minutes or so to Jackson and 15-20 minutes to Grand Teton national park) that you get the wonderful feel of the grandeur and beauty of Wyoming while being close enough to restaurants and nightlife if you so desire. The drive to Jackson is particularly easy. Finally, I have to emphasize what an incredible host Chuck, the owner of the cabin, was. He sent us pamphlets and his own personal recommendations of things to do, trails to hike and places to eat in the Jackson/Grand Teton/Yellowstone area far in advance of our actual stay. He also had a surprise waiting for us upon arrival (which I won't ruin for future guests) and was all around the definition of class. In the end, we were incredibly sad to leave and left with the thought we want to have our own Lazy Willow some day. We wouldn't change a thing. You will love your time and experience at the Lazy Willow and the Jackson area in general and we can't possibly recommend it enough. The 'Lazy Willow' is located near the small town of Wilson and about a 10 minute drive to the town of Jackson. We are located in an open area with aspen, willow and pines trees and surrounded by green pastureland. There are unobstructed views of the Tetons and Sleeping Indian Peak from every part of the property. Teton Villlage is 7 miles north and the Snake River about a mile East of the 'Lazy Willow'. The entrance to Grand Teton Nation Park is about a 20 minute drive and Yellowstone 60 miles north.